I've got a crush on elephants lately and I just love these! I am a notebook junkie, and like to always have a notepad handy. This colorful Elephants on parade by the Mary Beth Goodwin is darling!! I just love her designs, and who doesn't love a monogram? The gold necklace is dainty and petite. Another thing that seems to be drawing me in! I came across this little fella on a necklace by way of this post, and it is just so cute! I would never have imagined I would like elephants as much as I am drawn to them recently, but when they are this cute its hard to pass on them! My great Aunt Emma loved elephants, and had several styles of them decorating her house. I guess it finally rubbed off on me! The lamp is so whimsical, and would be cute in a nursery. I think if you sat him on your desk he could brighten your day just by his cute little pose! Sometimes I wish I had a nursery to decorate just so I had a good excuse to buy these cute things! The sweater has to be hands down my favorite piece of clothing with an animal on it yet! I love this guy! Don't be surprised to see me sporting him very soon here too! So tell me, what are you crushing lately? 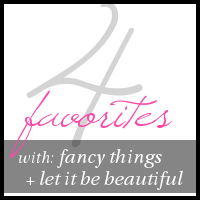 Don't forget to see what other favorites there are today! LOVE that notebook! And that lamp is too cute, I have a friend who is pregnant and decorating her nursery in an elephant theme...that would be perfect for her! That elephant is so dainty and adorable! I love elephants too. I have several vintage elephant pieces online. Love the elephants and they're lucky when the trunks are up! How adorable is that sweater! !